The eggs the second video is moving much better than any of my current non stick pans, and I would like to obtain that result, and possible mantain it without removing the seasoning. Which one do you recon works better? I also have an electric stove, so it may be better using the oven instead. 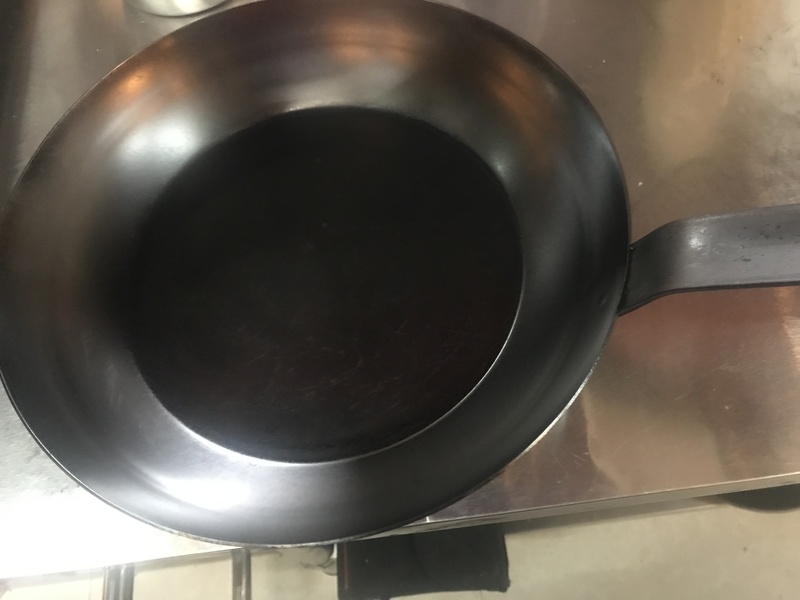 It might be better for you to understand some of the factors involved, and make your own decision how to treat your pan. Below is some basic information I think you will find helpful. Background: I've successfully reclaimed old, rusty pans, fixed a few that family put in the dishwasher (TERRIBLE IDEA) and so on, and maintain my own regularly. Cast iron is "seasoned" when it develops a highly carbonized and oxidized surface. This surface coating is both harder and more slippery than the plain iron. This surface only truly develops with 3 things: High heat, carbon and oxygen in the presence of your pan. The heat can be provided by a stove, oven, campfire, grill, torch, etc. The Carbon can be provided most effectively by some kind of oil. I prefer crisco/shortening most. Baconfat second, but that's just an opinion. The third thing is oxygen. That's in the air, so it is both free and plentiful. Now, other things to consider. If you have an unseasoned, rusty or poorly seasoned pan, it actually might be best to "start over". Using some kind of abrasive (steel wool, sos pad, even light sand paper) you can remove any unwanted coating, until you get to the grey, dull iron underneath. Then apply oil, and apply high heat in the presence of oxygen. Sometimes this coating may take several applications to develop, and will actually get smoother and darker with use. Rubbing with things like salt and whatnot can actually act to kind of polish the surface. And the best part is, if you truly don't like how an application turned out, scrub it raw, and start over. You'll be removing almost immeasurable amounts of the iron. I have my GREAT GREAT Grandmother's skillet, and it has been seasoned and re-seasoned perhaps a hundred times in its life. The rest is mostly guesswork, opinion and conjecture. I do the same for the cast iron or carbon steel. Heat up on stove when new or stripped down. Let it cool to room temp Apply very thin layer of flaxseed Place upside down to oven on high. Do the cycle of coating and baking 3 times. What is the purpose of using potato peels for seasoning a cast iron pan?